The 2017 Resource Guide provides summary and contact information about sources of help for people living in the Yarmouth, Maine area. 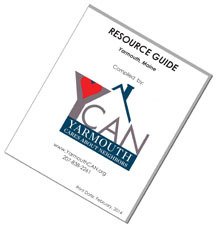 This guide was compiled by Yarmouth CAN as part of an effort to connect resources with people who need them. Click on the link above to download the Resource Guide in a format suitable for viewing on the screen or printing on one side of each page (492K PDF). Or, if you have a printer capable of printing on both sides of each page, you may click here to download the “booklet” version of this document – the page order will look wrong on the screen, but will come out correctly when printed on both sides of each page (set printer to flip page on short side).